If you are serious about visiting Venice, getting to know the city properly, and touring its most famous sights for the first time - try not to visit in summer. Between June and early September, but especially throughout the whole of July and August, you won't see tourist Venice at its best. Each summer, invasions of day-trippers and 'rude' tourists bring the city to its knees. Residents and lovers of the city tend to stay away as much as possible. The idea that Venice smells in summer is an old and inaccurate myth, but the number of tourists and some of their behaviour does stink. The ferries used by tourists are packed and attract pick-pockets, the popular tourist areas are literally crammed with visitors, and day-trippers behaving anti-socially - picnicking on bridges, leaving litter - can make getting around an unenjoyable experience. In addition, the weather can be stiflingly humid and hot, and in the height of summer many local businesses close for their holiday. But despite all that, it is still possible to enjoy a stay in Venice even in the hottest, busiest weeks of the year. You just need to adjust your plans and expectations accordingly, be prepared, and follow the examples of Venetians and insiders who are used to living with the heat and the crowds. I used to enjoy pottering around on summer evenings when I lived in Venice, and I now enjoy regular weeks staying in the city in July/August. It helps if you have visited Venice before, and are already familiar with the biggest tourist attractions, especially around the Rialto and St. Mark's. That way you can avoid those areas as much as possible and concentrate on exploring further afield. If you have to go there, aim for early in the morning or early evening, to avoid the worst of the day-tripping crowds. The best way to enjoy Venice in summer is to aim for a 'summer holiday' and not a 'city break'. Instead of rushing around with an open guidebook trying to see as much as possible, head out to quiet far-flung canals. Catch a boat to other lagoon islands. Relax on a sun-lounger on the historic beaches of the Lido, and take cooling dips in the Adriatic. Explore Venice's canals in the hours before and after sunset, when the city is magical, and so much emptier. It may sound perverse to enjoy a holiday in Venice by leaving the city, but the lagoon, the beach, the seashore and other islands are excellent destinations in their own right and often neglected by visitors who are focussed on the architectural and artistic jewels of central Venice. 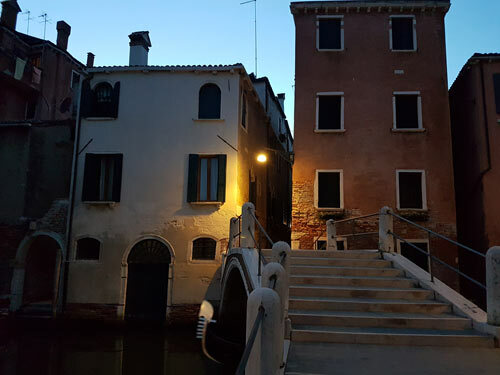 Basing yourself in Venice and enjoying it at quieter times of day and night, while heading off on daytime escapes by ferry, you can have the best of both worlds. Venice's seaside is a short boat journey away, on the Lido, a long thin island between the Venetian lagoon and the Adriatic sea. Ferries head from various stops in Venice to the main Lido ferry stop. If you study a map of vaporetto routes, you can work out which is the most convenient route from your accommodation. I actually consider this when choosing where I stay in summer. Near one of the 'outer shores' of Venice is good, as you can catch one of the small motoscafi which head around Venice's edges then across to the Lido (5.1 and 5.2). The number 1, which runs down the Grand Canal, gets very crowded with tourists, but does have the advantage of being frequent and having a larger capacity. With some close scrutiny of the timetables, you might find a quick and comfortable journey using one of the special summer Lido services used mostly by locals (one runs in the morning from the Zattere and Giudecca). If you manage to stand or sit outdoors on the boat, then the actual journey is a pleasant part of the holiday experience, with the wind in your hair and fantastic views. The seashore is a 10-minute walk from the ferry stop on the Lido, with the choice of free or fee-paying beaches. It's not the most wonderful beach in the world, and the water can be seaweedy, but with wide sands, gently deepening water, lifeguards and comfortable sea temperatures, it's a very pleasant place to spend a half-day or longer. The walk passes shops, cafés and restaurants so you can buy a fresh-fruit ice granita or a gelato on your way, fill your bottle up at a drinking-water tap and stock up on anything you need before reaching the beach. It is also interesting to look at some of the period architecture up the side-streets, or to explore further afield by bicycle.If you think you might like to spend more time here, you could consider a hotel on the Lido, which is generally cheaper than Venice. The best-known lagoon islands, Murano, Burano and Torcello, are popular with tourists, and although you'll be getting away from Venice, there are still likely to be crowds, on Murano and Burano at least. If heading to Burano, alight early from the ferry to visit the quieter, rural Mazzorbo. Follow the Venetians' example, though, and head to Sant'Erasmo or Le Vignole, and you'll find a whole other world. 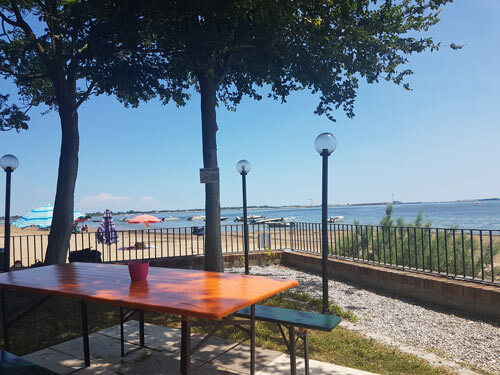 Venetians take their boats out into the lagoon on a hot day, often mooring just off the shore of Sant'Erasmo where they can wade on mudbanks, come ashore onto a muddy beach to eat family feasts, or visit the island bar-restaurant and sit under the trees in a fresh breeze. Without your own boat, you can catch the public ferry and walk across the island to the bar. There's a scenic stroll along the lagoon shore, the chance to hire bicycles, the fascinating social spectacle of scores of Venetian families with boats enjoying a traditional summer escape from tourism, and the option of simply taking a book, buying a cheap glass of white wine, and relaxing in the restaurant's garden under trees, with views across the lagoon and a breeze from the sea. The smaller island of Le Vignole offers a bit less to explore, but has a popular trattoria. If you don't have time to travel so far from Venice, the island of La Certosa is a curious off-the-beaten-track destination just off the eastern end of Venice and a request stop for the ferry. One of the many lagoon islands with a military background and ruins, it now houses a hotel with a public restaurant, a marina, rabbits and sometimes a small flock of goats. A path runs around the island past the marina and through trees, and makes a pleasant stroll at any time of year, as it's such a contrast to nearby Venice. Urban and close at hand, the island of the Giudecca is much quieter, with good views of Venice, and you can stroll here at leisure visiting the low-key sights. It's a much longer day out, unless you're staying on the Lido, but taking the number 11 bus-and-ferry combination south from the Lido brings you to the fishermen's island of Pellestrina, the seaside nature reserve of Ca' Roman and ultimately to the picturesque fishing town of Chioggia and its beach resort, Sottomarina. As I feel under no pressure to visit the touristy areas, I've spent whole weeks in summer without going near St Mark's. 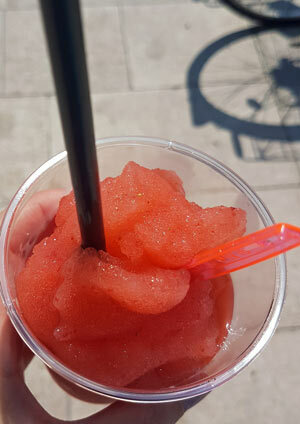 An ideal, lazy summer day might be a morning boat ride to the Lido on a seasonal ferry service (outdoor seat at the front for a breathtakingly scenic journey) followed by a walk to the beach, buying a fresh peach granita on the way. I'd then pay for a sun lounger and spend a few hours on the beach, in the sea or reading under a shady parasol in a sea breeze. For lunch: a take-away pizza wrap or picnic. Then a stroll back to the ferry stop, possibly buying an ice cream. On a more energetic day, I might catch a ferry to Sant'Erasmo, go for a walk on the island and eat lunch there, before catching a ferry to the Lido and the seaside. Back in Venice I'd spend a while in my air-conditioned accommodation, showering, rinsing beach wear and cooling down. Then around six I'd head out for a stroll, or an aperitivo in some scenic or breezy local spot. If I hadn't already booked a table, I'd head to a restaurant early - 7.30pm or 8pm - picking somewhere which is out of the main tourist areas. Remote spots of Dorsoduro or a canalside table in north Cannaregio are good choices. If I feel the need to visit tourist areas, I'd do it in the evening, maybe for an expensive glass of wine at Caffe Florian while the orchestra plays. Then next day I might head to another island for a walk and a picnic, or do a sightseeing ramble off-the-beaten-track. If this is your first or only chance to visit Venice, and you can't avoid the peak summer months, then do try to pace yourselves. As suggested above, visit tourist sights as soon as they open or just before they close (check the time for last admissions). Spend the hottest part of the afternoon in a park or resting in air-conditioned interiors. Take time out to follow some of the 'summer holiday' suggestions above, to enjoy respite from the crowds and heat. 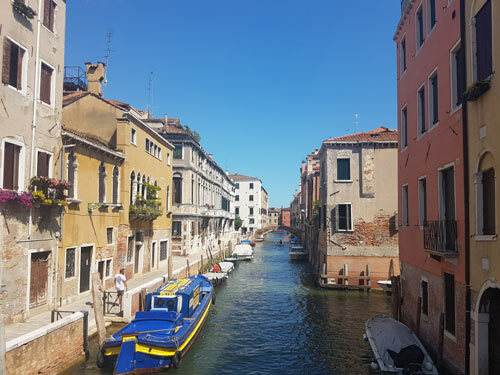 If you would like to explore and see some of Venice's picturesque districts, opt for the ones with fewest crowds, furthest from St. Mark's (the walks in the Italy Heaven guidebook provide tours of Castello, of Cannaregio and Dorsoduro which visit some very quiet areas). You will be amazed at the contrast between tourist areas and the scene only a few minutes' walk away. > Use insect repellent and/or wear long trousers after dark, and keep windows closed. Venice's mosquitoes are infamous. > Check the forecast. There are occasional dramatic storms in summer with the possibility of high winds, torrential rain and even hailstones. Don't be caught unprepared. Do you know which side of a lane to walk, what clothing you could be fined for, and whether you can take a dip in a canal? Every summer local newspapers and conversations in Venice are full of the latest tourist 'outrages'. Please read about how to behave in Venice and do your bit to keep tourism a positive experience for everyone. > This website and the Italy Heaven Guide to Venice (ebook) provide lots of ideas for exploring off-the-beaten-track and finding less touristy places to eat and drink. Prepare some ideas in advance and then when you reach Venice you'll be able to avoid shuffling along with crowds of day-trippers, wondering what anyone sees in the city. 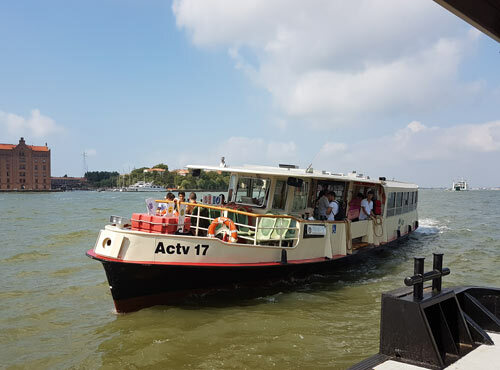 > ACTV timetables - look out for special summer ferry services like the 6 connecting Piazzale Roma and a couple of other stops with the Lido. As well as regular Lido ferries, here is usually a extra boat, (currently the 8), connecting southern Venice with the Lido for a day at the beach. Another service, which varies year to year, connects the Lido with Murano and a variant on this service (the 13 at time of writing) runs from the Lido to Sant'Erasmo a few times a day, stopping by the island's restaurant. Planning around this can make for a very enjoyable day out and interesting scenery on the boat ride. 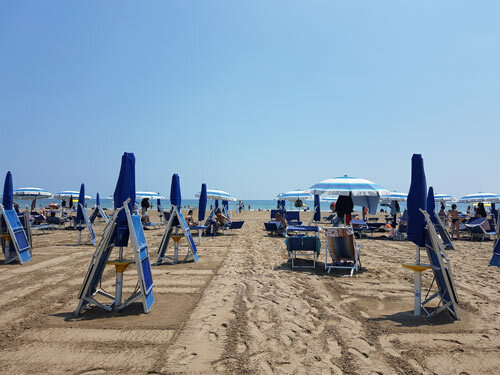 Other services (14, 15) run from the Lido and St Mark's (San Zaccaria stop) to Punta Sabbioni for a bus connection to Lido di Jesolo. Or if you plan carefully, you could even tour the lagoon by public boat in this fashion, by catching an onward service (the 12) from Punta Sabbioni to Burano, Mazzorbo and on to Venice.